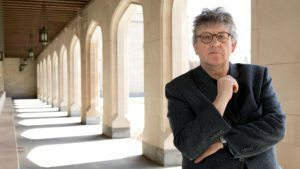 Princeton University Professor and Pulitzer Prize-winning poet Paul Muldoon has been awarded The Queen’s Gold Medal for Poetry for the year 2017. Britain’s Queen Elizabeth bestows the honor of a Gold Medal for Poetry for excellence in poetry, either on the basis of a body of work over several years or for an outstanding poetry collection issued during the year of the award. The Gold Medal for Poetry was first instituted by King George V at the suggestion of John Masefield, Britain’s then Poet Laureate. Including Muldoon, 46 poets have received the award since its founding, beginning with Laurence Whistler in 1934. Muldoon is the second Irish poet to receive the honor, following Michael Longley’s award in 2001. The 2016 Award was given to British poet Gillian Allnutt. Muldoon will receive the medal from Queen Elizabeth in an upcoming ceremony. Paul Muldoon is the Howard G.B. Clark ’21 University Professor in the Humanities, Director of the Lewis Center for the Arts’ Princeton Atelier, and Professor of Creative Writing at Princeton University. He was also Founding Chair of the Lewis Center for the Arts and has served as Poetry Editor of The New Yorker since 2007. Muldoon’s main collections of poetry are New Weather (1973), Mules (1977), Why Brownlee Left (1980), Quoof (1983), Meeting The British (1987), Madoc: A Mystery (1990), The Annals of Chile (1994), Hay (1998), Poems 1968-1998 (2001), Moy Sand and Gravel (2002), Horse Latitudes (2006), Maggot (2010), One Thousand Things Worth Knowing (2015), and Selected Poems 1968-2014 (2016). His other written works include children’s literature, works of criticism, and song lyrics. This spring at Princeton, Muldoon will teach an Advanced Poetry course in the Program in Creative Writing, along with the popular creative writing and music course, “How to Write a Song.” In that class, which he co-teaches with Grammy Award-winning Professor of Music Steven Mackey, Muldoon introduces students to the art of writing words for music inspired by such emotionally charged themes as contempt, gratitude, revenge, desire, disgust, defiance, and more. To learn more about the Lewis Center for the Arts at Princeton University, visit arts.princeton.edu.